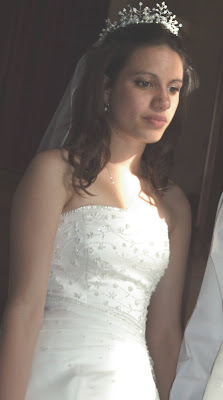 This was a piece commissioned by a bride for her wedding day, it looked very dramatic. 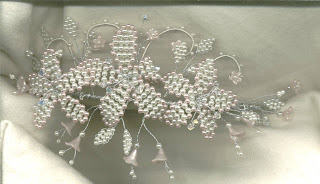 The petals were individually wired with a french beading technique using various sized pearls and crystals to create texture. 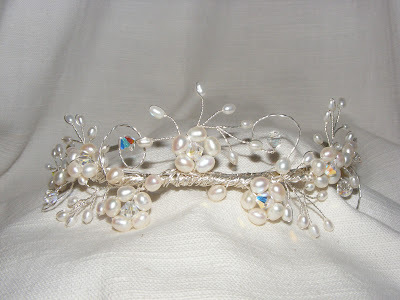 Freshwater pearl flowers with crystal centres, silver wire swirls. Twisted together and attached to a tiara band. 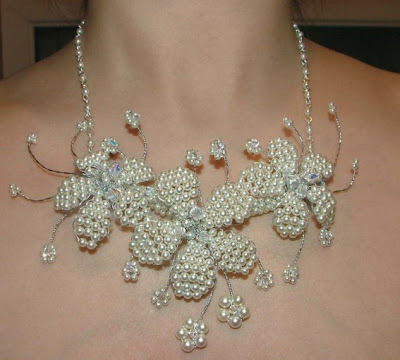 This was made for a bride who wanted a spectacular statement necklace. Pearl flower petals surrounded by small pearl flowers with crystal centres. The bracelet was lovely and jangly with lots of movement. 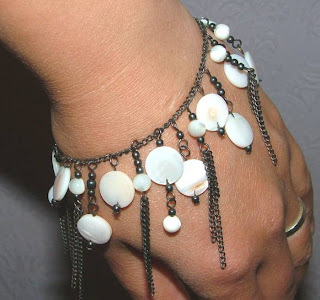 Made with Mother of Pearl beads and black chain. This is a set I made for my sister to wear to a wedding. She has a lovely long neck, so these earings are super long! Ingredients: Mother of Pearl coin beads and 6mm beads, black coloured chain and beads. This was comissioned by a friend of mine, she has had numerous pieces from me over the years. She would often come to me with a sketch drawn on the back of an envelope for me to create - this was one of them. Pressed flower beads with glass roccailes. ... it's not a great picture as it was done on my scanner pre digital camera days! 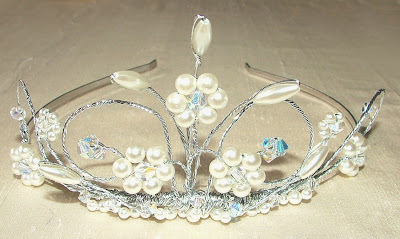 This was probably the first tiara I ever made. It was worn 8 years ago today. Although I'm a little ashamed of the wire work, it's nice to think that my technique has developed over the years. However, I still love the colours and the freshwater pearl flowers. Pearl flowers and pink crystals and glass flowers. Pearl flowers with a crystal centre, twisted wire swirls. Welcome to my jewellery blog. The idea is that it provides an online catalogue of my work for potential customers to see what I can create or to give inspiration to fellow bead and wire artists. Please leave a comment if you are intersted in comissioning me to make you a piece of jewellery.